Welcome back. In case you missed it, the U.S. Department of Health and Human Services released the second edition of its Physical Activity Guidelines for Americans. There’s a summary of the 117-page report in the Journal of the American Medical Association (JAMA). Like the first edition, published in 2008, the report’s overriding message is that regular physical activity has health benefits for everyone, regardless of age, gender, race, ethnicity or body size. 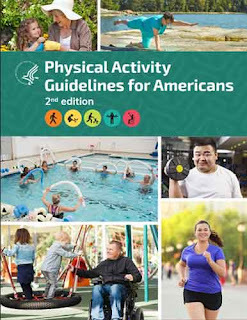 Guidance on the types and amounts of physical activity to improve health outcomes is provided for preschool-aged children to older adults, with a section for pregnant and postpartum women and adults with chronic conditions or disabilities. To encourage and be accommodating the key guidelines for adults opens with: Adults should move more and sit less throughout the day. Some physical activity is better than none. Which brings me to the main topic of this blog post: a pilot study from the University of Massachusetts, Amherst. The researchers compared the metabolic and work-skill effects of pedaling, while sitting at a pedal desk, with those of just sitting at a standard office desk. 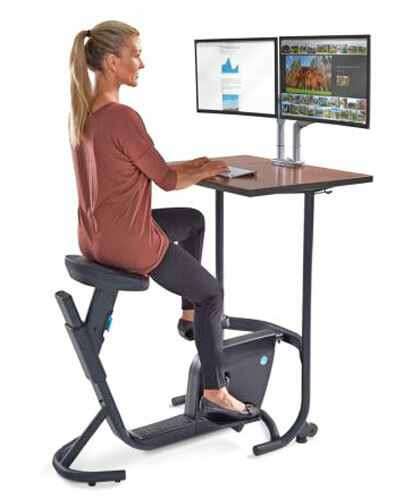 Different configurations of pedal or bike desks or detached under-desk peddlers have been around for several years. They’ve found principal acceptance occupying fidgeting students in K-12 classrooms, but along with standing desks and treadmill desks, they’re making inroads in other venues. 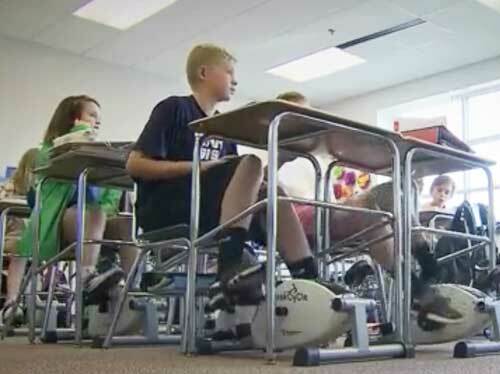 Under-desk peddlers in a North Carolina middle-school classroom, 2016 (from www.thisisinsider.com/teacher-bike-pedals-desks-concentration-2016-9). 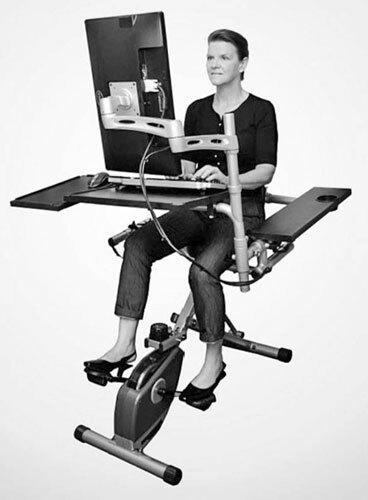 The study was undertaken because desks configured with a seated pedal apparatus could be an important tool for reducing workplace inactivity. This is especially the case since pedal desks are self-paced, relatively easy to use by workers with existing musculoskeletal problems or reduced mobility, oriented toward non–weight-bearing activities and minimally disruptive. Twelve overweight or obese, sedentary office workers (6 men, 6 women, age 21 to 64) were tested in two conditions at least six days apart: (1) seated at a pedal desk, pedaling at a self-selected, light-intensity pace for 2 hours and (2) seated at a conventional workstation for 2 hours. (see P.S. link to study). At both test sessions, participants rested for 20 minutes and had an intravenous catheter inserted for blood sampling. After baseline fasting sample collection, the participants were given a standardized meal (cornflakes, heavy cream and whole milk) to be consumed over a 10-minute period. Blood samples for glucose, insulin and free fatty acid concentrations were collected every 15 minutes during the remainder of the post-meal test while participants performed scripted computer-based work tasks (Stroop test, mouse proficiency test, choice reaction, typing and reading comprehension). The study found the participants’ use of the pedal desk required significantly less insulin to maintain glucose concentrations than did their use of the standard desk. There were no significant changes in plasma glucose and free-fatty acid concentrations with the pedal desk at any observed time. In addition, the only significant difference in work skills measurements was a slower mouse-clicking response with the pedal desk; however, the average difference was only 2.2 seconds over approximately 1 minute of testing. 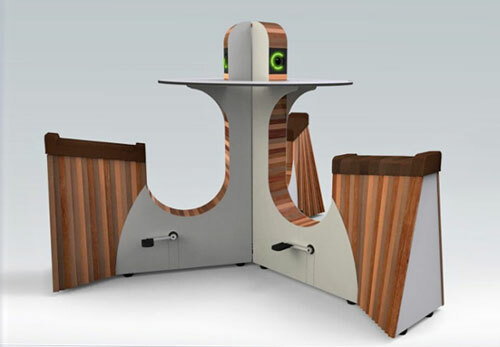 Although the study results are based on only 12 participants, the lower post-meal insulin concentrations with no negative impact on work skills suggest that use of a pedal desk could help achieve public and occupational health goals in sedentary work environments. And there’s another potential benefit. All that pedaling could be used to produce some amount of electrical power. 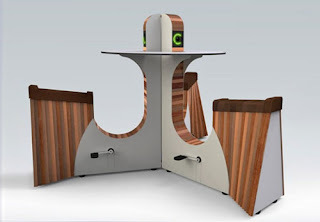 In fact, CNET featured a company that was seeking Kickstarter funding to pursue that goal in 2013, and at least one company is now marketing power-generating bike desks and sustainable office kiosks. 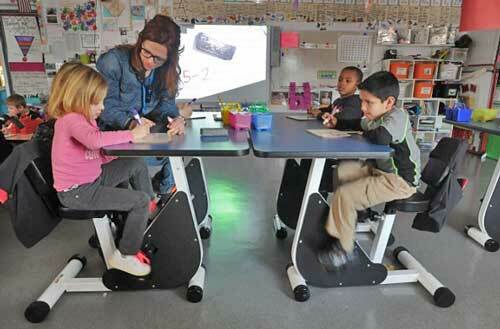 Pedal desks in elementary school classroom—note the blurry pedaling feet (from www.youthfit.com/kinesthetic-classroom/pedal-desks). Who knows? Perhaps those fidgeting grade-school kids could keep the whole school lit up. Thanks for stopping by.